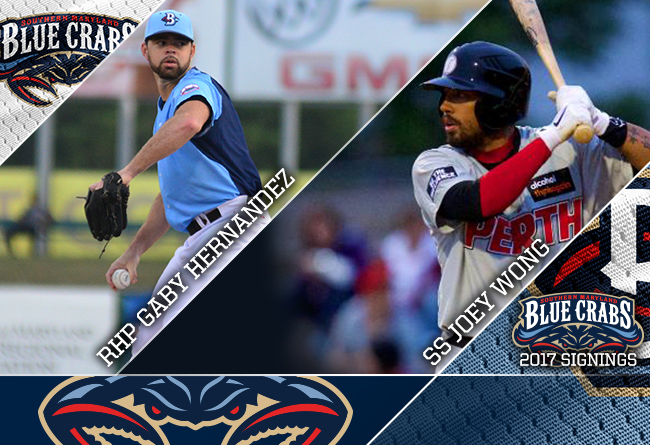 (Waldorf, Md., Feb. 23, 2017) – The Blue Crabs announced the signings of right-handed pitcher Gaby Hernandez and shortstop Joey Wong to the 2017 10th Anniversary season roster. Gaby Hernandez returns to the Blue Crabs for his sixth season. Hernandez’s 2016 campaign on the surface was marred by a 4.88 ERA, but the 30-year-old pitched 153 innings, his second highest total in a Blue Crabs uniform. He tallied a career high of 150 strikeouts and had a career-best .963 fielding percentage; committing only one error with a career high of eleven putouts. The Miami, FL native joined the Blue Crabs for the first time in 2012 and has started in at least 25 games in three of his five seasons with the organization. Joey Wong joins the Blue Crabs and the Atlantic League after an eight-year run with the Colorado Rockies organization. A 2009 draft pick, Wong is an infielder by trade who primarily plays shortstop, logging 400 games at the position. He played over 300 games at second and third respectfully. The lefty bat has a career .249 batting average and is stellar against right-handed pitchers. Wong’s glove is an asset to the Blue Crabs as he had a .976 fielding percentage at shortstop while recording 53 double plays in 2016 with AAA Albuquerque. The Blue Crabs open up the 2017 season on April 20th in Waldorf, MD versus the Long Island Ducks. For information regarding tickets and other team news, visit http://www.somdbluecrabs.com or call 301-638-9788. The Blue Crabs play 140 regular season games in the Atlantic League of Professional Baseball Clubs. The Blue Crabs play at Regency Furniture Stadium in Waldorf, Maryland with affordable family fun. The franchise will open its tenth anniversary season on Thursday April 20, 2017. Please call 301-638-9788 or visit http://www.somdbluecrabs.com for more information and to reserve your seat at the ballpark today!